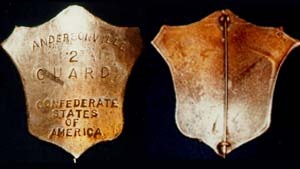 Q. I don't have a photo of it and couldn't get good rubbings either, but I'm sending you some crude drawings of a coin silver (marked) "Andersonville 2 Guard Confederate States of America" badge. To be honest, I picked it up in trade, and the other guy wouldn't say where it was dug. Anyway, I think you'll agree it's one heck of a find. Never mind what I gave for it... what do you think it's worth? A. Maybe a bag of doughnuts. It's a fake- or, for those purists who prefer technical accuracy and gentle epithets, a "fantasy." The one shown here was bought by another reader a little over two years ago, and since then several more have been reported, in addition to your own. Enough already. Even though it's too late to "kill it before it crawls," let's hope we've seen the last of it now that the word is out. Unfortunately, now bogus badges of other designs are starting to turn up. So, caveat emptor, y'all. It's always open season on the unsuspecting. Q. Mark, I found this carved stone in a plowed field in Canada and am wondering if you have any clue as to what it might be. It is about 3-1/4" long and 1-1/4" wide, brown with dark stripes, and has a hole drilled through each end. A narrow groove connects the holes on one side. Special thanks to longtime W&ET contributor Lar Hothem, author of North American Indian Artifacts and numerous related references. Q. found this "One Yen" coin at a site along Lake Erie. I think it was made either in England or America for use in the Orient, but would like more information about it. A. t's a Japanese yen and 90% (.900 fine) silver. The denomination appears in large characters beneath a chrysanthemum, symbol of the Japanese emperor, and "One Yen" in English was added to the opposite side to facilitate trade. The inscription around the dragon identifies it as a coin of Dai Nippon ("Great Japan") from the Meiji ("Brilliant Rule") of Emperor Mutsuhito, struck in Year 15 (1882). Value? $75 in Very Fine condition. Q. This gutta-percha snuff box from the mid-1800s has numerous Masonic devices, as well as the rose & cross of the Rosicrucians. It also bears a bird with a nest of chicks, which I believe is from the state seal of Louisiana. Could this relate to the Confederacy or the Civil War? A. It's from that era, all right; but as far as I can determine, the embossings are entirely Masonic. While the image of a pelican tearing its breast to feed its young does serve as the Louisiana state seal, in fact its symbolic usage dates back to antiquity. Referred to in heraldry as "a pelican in its piety," it typified self-sacrifice, and especially Christ's gift of his blood on the cross for the salvation of man. In Freemasonry, both the pelican and the rose & cross are associated with the Rose Croix (18th) degree, which accounts for their use in this instance. Incidentally, photos of the box were sent to a couple of collectors of fraternal memorabilia, and their estimates hovered around $125-175. Q. I recently found this Wisconsin Semicentennial (1848-1898) pin and am hoping you can tell me how rare and valuable it might be. Much of the original gilt is still intact, and so is the pin on the back. Interestingly, 1998 is Wisconsin's Sesquicentennial, which means that I found the pin almost exactly 100 years after it was issued. A. Souvenir badges like this were popular around the turn of the century and often produced in sizable quantities for all sorts of commemorative celebrations, special events, fairs, conventions, etc. In some cases they may have been complimentary, but usually they were sold. Some were official souvenirs offered by sponsors to help offset the cost of the event &/or raise money for some other purpose; others were simply novelties hawked by vendors, just as buttons, caps, and T-shirts are at similar venues today. Ordinarily, I'd tag it at $20-30, but it might bring an extra buck or two right now during Wisconsin's 150th anniversary. Q. Here's a ring that I dug at an old picnic grove. As you can see, it was totally flattened when I found it, but reshaped and cleaned up very well. It's made of brass, and everything is readable, although there is some pitting. What can you tell me about it? A. Too bad you didn't write before you "reshaped" it. I'll admit that it looks a little odd, but the thing was made flat, with wings or bars on the sides, just the way you found it. It's the Melvin Purvis 1936 Junior G-Man Corps Girls Division membership badge, a Post cereal premium that lists for $15 or more in Good condition- as a badge, not a ring. Now, before some other TH'er takes things too far in the opposite direction, let me quickly add that there is a 1936 Melvin Purvis Junior G-Man Corps, worth up to $75. It's also shield shaped, but there are stars and triangles on the sides.